Thorough medical evaluation - recommendations & answers. Detailed, timely replies. Without travel or waiting rooms. Mean response time: 6 hours. Guaranteed replies within 24 hours. Join the 500,000 people who found a smarter, quicker way to get Medical Answers, Second Opinions from Expert Doctors. Recommendation on next step. Second-opinion.Multi-specialty. Average time for answers: 6 hours. $35 for typical specialist consult vs. $120 for a local appointment. Clarify, ask further questions for free in private conversation. Money back guarantee for the 1st reply. MEDNET Quality Board. 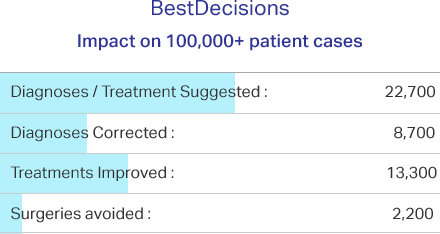 Helped over 500,000 patients with 98%+ Satisfaction. Describe your health concern. Upload reports, pictures, if any. Make Payment of $35 to consult a specialist. Get answers, recommendations on your symptoms, diagnosis, treatment plan. Mean response time: 6 hours. Seek clarifications, ask further questions, share more reports, change in condition in an ongoing private conversation. Free! Thank you so much. This totally solved my issue without me having to spend hundreds of dollars and waiting weeks to go to a doctor in person. I am so glad there is a service that saves me all that trouble when I have a simple, non-serious health issue. The Doctor responded promptly to my question and urged me to confirm her diagnosis with a dermatologist in real life just to be 100% sure. Overall I was pleased with her response time. Dr. Pathak, as well as DoctorSpring was very helpful in providing sensible information about given situation health situations. I think this is a wonderful option for those who do not have insurance, or perhaps someone who has a non-threatening condition that needs some answers but cannot go see the doctor. I am satisfied with the service that I received. It he response was within the 24 hours as guaranteed. My questions were answered and I now have a professional opinion of what I felt was wrong and can now go about treating it properly. Thank you for your services. Great Doctor. Replies very promptly and on time even through her busy schedule. Explains to you very clearly. Will be happy to recommend her. The doctor gave me good advise and with the conversation was putting pressure of my anxiety that something big was wrong with me. I am very satisfied with the response and the quick turnaround time. Although I will still follow up with my primary care doctor on Monday, this put my mind at ease over the weekend (as I tend to worry about my health a lot). Thank you so much; I would recommend to people AND will use again if necessary. Dr. Pathak was an amazing doctor, caring, knowledgeable and prompt in providing feedback. This really put my mind at ease. This service is affordable and convenient. Thank you. The doctor was very helpful, gave a quick diagnosis and treatment suggestions. There are sites that offer a doctor and you come away feeling you went to a discount store to ask someone who is thinking of going to medical school what he or she thinks. I know I can't be examined this way, but Dr. Pandy was very clear in what he was saying and why. It is something I can take to a doctor and feel confident in expressing concern for the need for certain tests. This was such a fair price for inquiring to a specialist. I do understand this is not a diagnosis but it is a step in the right direction and it more than I had before. I didn't use all my questions but I feel I received a bargain. A thoughtful, studied and intelligent response to a anxious situation. Thank you, I appreciate the service and would recommend highly. I really appreciate doctors like Dr. Kumar making themselves available for consultations with people like me they don't know and can't examine personally. I don't like discussing my medical problems with friends or family but when I am going through a medical crisis like my present one I appreciate someone knowledgeable about my medical issues to talk with other than my own doctor. I feel alone, scared and depressed about my condition and DoctorSpring offered me a place to turn for advice and comfort. Thank you, DoctorSpring. I felt like I was at a lost and had no where to turn. I heard about this site so I thought, why not give it a shot? I asked questions about my conditions and an internal medicine specialist got back to me within a couple of hours. Thank you so much to Dr. Deepu Sebin Sebastian for taking the time to listen to my symptoms and provide amazing feedback. I know I will use this site again for future questions about my conditions. Very on the ball. Dr Perigela provided me with pretty much the same information as a private physician who saw me this eve. Gave me antibiotics, anti-inflammatory and painkillers. He said they were my lymph nodes but couldn't find a source of inflammation after careful examination. Thoroughly recommend Dr Perigela and the service for peace of mind and rapid response! It gives me peace of mind to know that I can send a message to a real doctor and get answers without having to take my child to the doctor to wait in a germ-filled waiting room for minor conditions. Thank you Dr. Sebastion for your help with this question. It sets my mind at ease to know that you do not think these bites are necessarily related to a bug in my home. I highly appreciate the objective replies by Dr. Mahajan to my specific questions and would surely consult him again in the future. I would highly appreciate if it is possible to upload MULTIPLE reports accompanying a follow-up query. I could upload only one report and not more than one during the follow-up session. Thank you Doctor. Individual Consultation or Multi-specialty boards for complex cases. Licensed & Experienced Specialist Doctors who treat patients like you. Thorough review of case details, history, medical records, imaging, reports. Info, Answers, Recommendations on Diagnosis, Treatment, Latest Therapies. Average time for answers: 6 hours.Don’t wait days for appointments. Specialist consults only for $35. Savings vs. average $120 for a visit to Doctor. Free Follow-ups for a month. Direct access to in-house physicians, care-coordinators, support staff. Is this an emergency? Should I be worried? Do I need to visit a specialist? Am I missing anything? Is the diagnosis correct? Is this the right treatment for me? What questions should I ask my specialist Doctor? Is waiting for appointment OK? Are my reports normal? Are my Radiology scans OK? Your health problem can’t wait. Consult about Medical Dermatology - Acne, Rashes, Lesions, Cysts, Skin infections, Hair fall, Allergy, Dandruff, Cosmetic Dermatology, Vitiligo, Wrinkles (Botox & Fillers), Laser hair removal, Psoriasis; Venereal diseases, Sexually Transmitted Diseases. When should I use DoctorSpring.com? Our Doctors help hundreds of thousands of patients every year in making informed medical decisions regarding their symptoms, reports, diagnosis and treatment options. So whenever you are confused/worried about your symptoms, waiting for a specialist appointment, considering going to an ER, want second opinions, want to understand your reports, scans or want factual medical info - consulting our Doctors would help. We help you get personalised, actionable and helpful info from specialists rather than relying on misleading and general info on Google, WebMD. What is it like to consult here? What is the process? You start off by submitting your query. Either you would have chosen the specialist, or the in-house physicians assign the consult to Doctors on our board as per the nature of the questions. You get a reply in your account in a few hours. You would be intimated by email for the same. You can then ask follow-up queries for any clarifications, add details, etc. You could go back and forth like that till all your queries are answered. All our Doctors are Board certified and credentialed Specialists or Family Physicians in their respective country/state. Along with qualifying degrees - experience, research and track-record of practice are taken into account before a doctor is credentialed with DoctorSpring and is given privileges to answer paid queries. Typically one in hundred applicants makes the cut. These Doctors are well versed with the nuances of online consultations vis-a-vis physical appointments, and you can be assured that they would answer all your queries in detailed and helpful manner - no more getting rushed in and out of 5-minute appointments. Our MEDNET quality board consistently evaluate their replies to validate their medical accuracy and helpfulness. How much time does it take for Doctors to reply? It depends on nature of consultation. Typically consultations for GPs are answered in 2 hours and consulting a specialist takes 6 hours. Second opinions, medical board opinions from multiple Doctors take about one to seven days depending on the complexity of the case. For GP and specialist consults, we guarantee replies in 24 hours. We take pride in the fact that all our specialists are experienced Doctors with busy private practices –their experience and expertise puts them in a position to help you best. When it comes to a compromise, we feel in-depth, accurate and relevant replies from experienced and expert Doctors are significantly more important than quicker, possibly incomplete and inaccurate information. So although the specialists try to answer as soon as possible, as you may understand, it is impractical for such specialists to be online all the time or for them to be available for online chat. What is your privacy and safety policy? We follow industry standard security practices, and absolutely none of your personal information (email, personally identifiable information, reports, scans) is shared with anyone except the consulting Doctors. Please don't add names, emails, contact numbers to your questions. When should I not use DoctorSpring.com? DoctorSpring and for that matter, any online medical service shouldn't be used when it is an emergency when your symptoms are out of the ordinary and would require immediate attention. We would be of limited help when a physical checkup is essential or a prescription is needed. While pictures and videos help with most cases, sometimes the Doctor would recommend visiting a local Physician to make the best assessment. In such situations, you can, of course, after your appointment follow-up and discuss further with our Doctors. We also wouldn't be able to help with medico-legal cases. Can your Doctors help me with a prescription? In most cases, Doctors wouldn't be able to prescribe due to local laws and due to restrictions on prescriptions without a physical checkup. Doctors do recommend treatment options based on their experience with similar patients, and you are welcome to share this recommendation with your local specialist or GP to get a prescription. For how long is the consult valid? You get free follow-ups and can consult for a period of one month. In case you need an extension, say to get your reports, please write to us. One month is a general guide, and your satisfaction is paramount. Can I upload reports later? Or add more details? Yes, you can add or email the reports, details later. The in-house physicians would coordinate your consult. Specialist and GP one-time consults are backed by our money back guarantee. In case your consult wasn't answered as per your expectations, you could share your feedback. We would review the consult - in most cases seeking clarifications assures that your queries are answered. You could also opt for a change in the consulting Doctor. You could also opt for a refund in genuine cases where Doctor gave a misdiagnosis, didn't consult with utmost focus or missed any details. The grounds for dissatisfaction doesn't include suggestions for investigations, steps which can't be performed online or a recommendation to visit an ER / Consult a local physician. In such cases, the consult is open, and one can follow-up post investigation. Email us at support@doctorspring.com. We generally reply within an hour. Google The Weather, Not Your Medical Symptoms. The second opinion at DoctorSrping was very detailed and easy to understand. It helped us think completely different about the diagnosis and gave me a lot more info than any of my doctors locally had given me. Thank you for providing so much invaluable insights. Lisa received a second opinion for rectal cancer. Our mission is to help patients in crisis achieve better medical outcomes via timely & informed medical opinions from our ask a doctor platform. Via online doctor chat our leading, board-certified physicians provide provisional diagnosis, treatment and follow-up recommendations for most health issues - the common ones to the complex cases which may require second opinions, multi-specialty consultations. Any questions? support@doctorspring.com. We generally get back within minutes. Are you a top Doctor? Join! © 2012-2017 - DoctorSpring. All rights reserved. Please enter the password for your account. You could also Reset/Get the temporary password by email. Get password reset instructions by email.